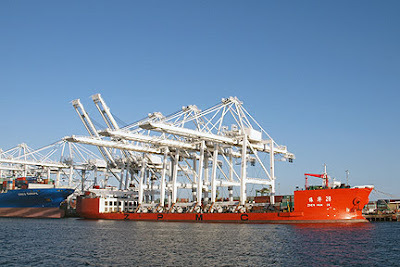 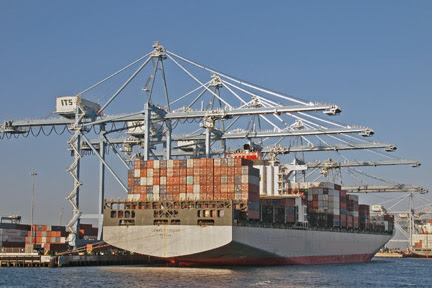 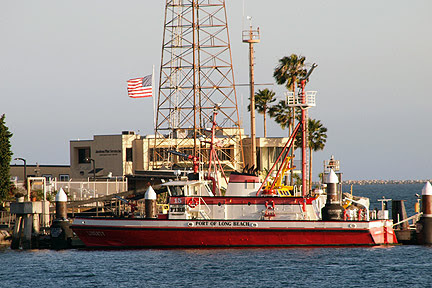 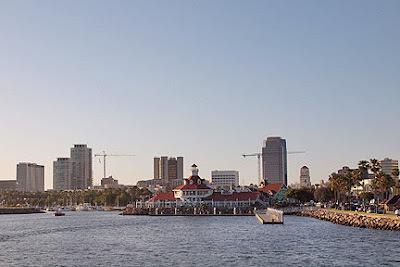 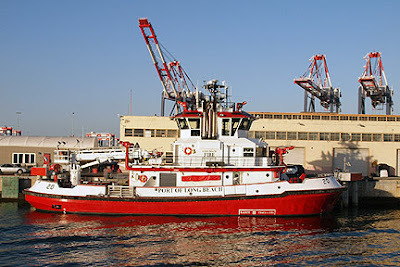 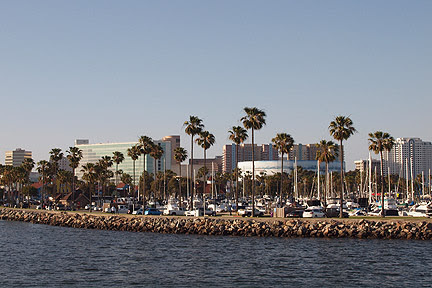 Long Beach is the second-busiest port in the United States, only out done by the Port of Los Angeles (San Pedro). Together, the San Pedro Bay Complex, is the largest port in the United States and the 10th largest in the world. There is scaffolding on one of the one of the smoke stakes. According to Naval architects the vessel is "approaching the point of no return." 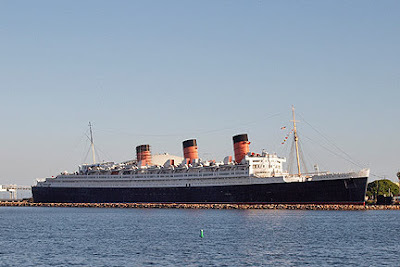 In March, the city of Long Beach approved $23 million to address the ship's most urgent repairs. 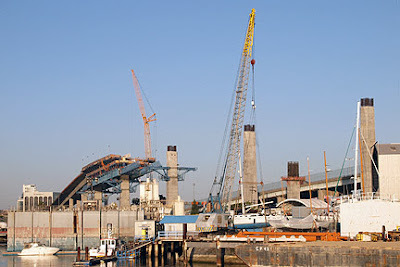 However, the estimated total cost of repairs is over $235 million, so its' fate is yet to be determined. THUMS (Texaco, Humble, Unocal, Mobil and Shell) is a group of four man-made islands designed to camouflage oil-drilling rigs. 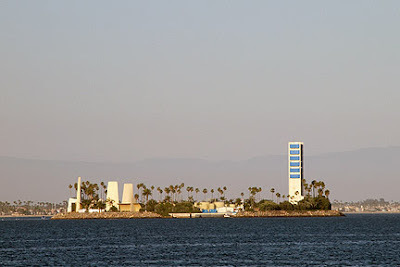 What looks like a blue striped building is a housing unit for a drilling rig that is on top of a railroad track that moves it around the island from well to well. 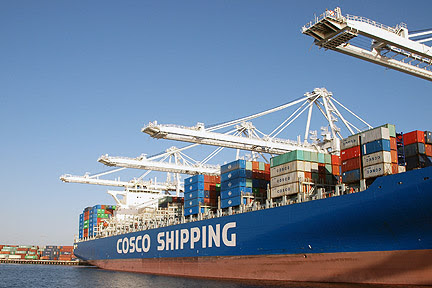 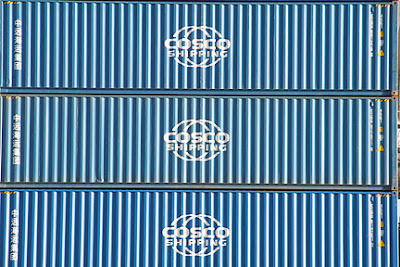 Cosco Shipping Lines is the national flag carrier of the People's Republic of China. 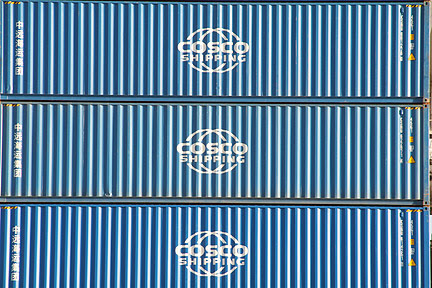 They recently merged with China Ocean Shipping, above is their new logo. 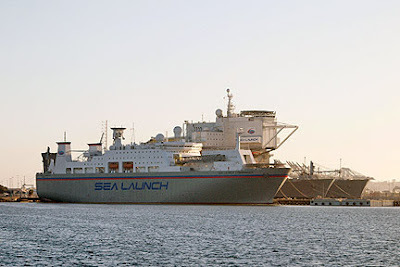 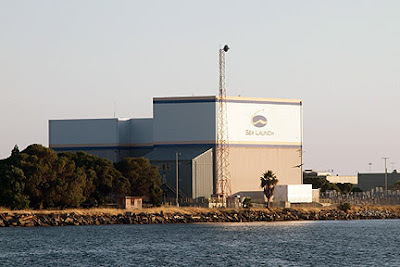 Sea Launch is a multinational spacecraft launch facility that uses a mobile maritime launch platform. Sea Launch Commander is docked in Long Beach and launches communication satellites from anywhere out at sea. 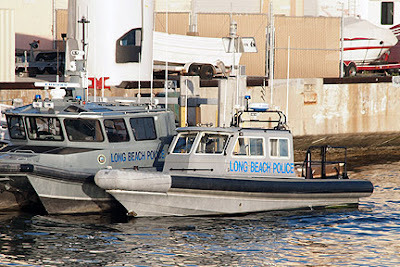 The Protector, built by Foss Maritime Co., mounts 10 water cannons with a capacity to throw more than 41,000 gallons per minute. 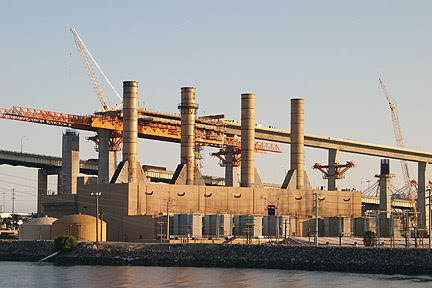 Built in 1927, the SCE Long Beach Power Generating Station was refurbished and re-powered by its new owner, NRC Energy Company. 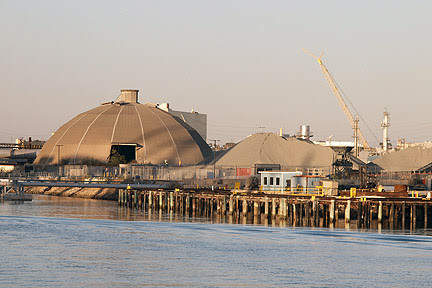 Since 2007, the NRG Long Beach Generating Station uses four simple cycle air-cooled units to generate enough power to supply over 200,00 homes. The first scene in 'The Monkees' 1968 movie, Head, has the foursome interrupting the dedication ceremony for this bridge, and then Micky Dolenz jumps into the water. 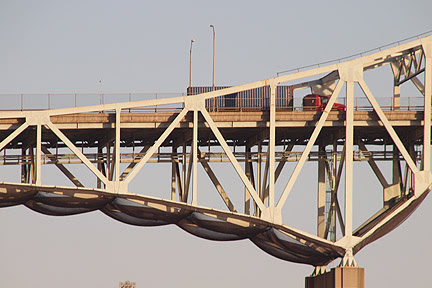 One section of the bridge has netting to catch any falling debris on the only portion that goes over a street. 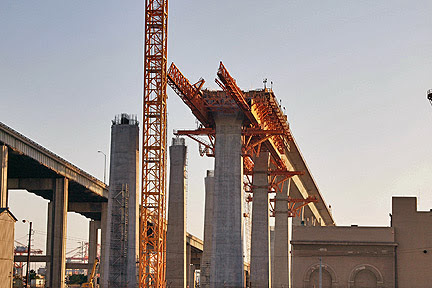 The current roadway has four lanes; the replacement (started in Jan. 2013) will have six lanes, with emergency lanes on each side. 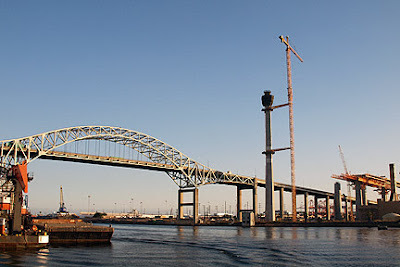 The construction of the new Gerald Desmond Bridge is the first project in California to use a Movable Scaffold System (MSS). The MSS is designed to bridge the 235 foot span between piers; it supports the concrete as it is poured for each span. 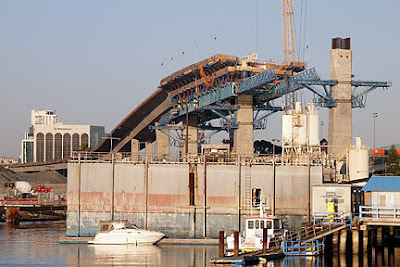 Once the concrete has cured the MSS moves to the next pier and repeats the pour. 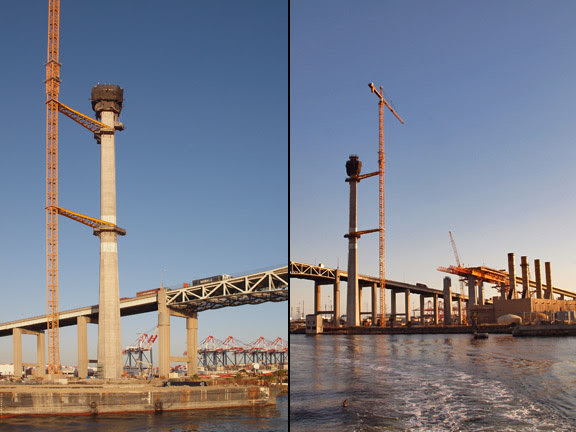 Reaching 500 feet, with a vertical clearance over 200 feet, the new bridge will allow access for the tallest container ships and will be the first long-span cable-stayed bridge in California. Scheduled for completion in 2018, the new bridge will have a pedestrian/bike path and observation decks.